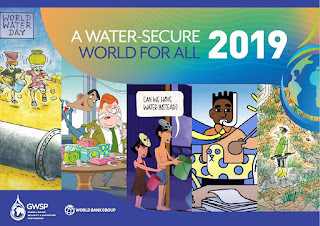 ♪ Acoustic Americana Music Guide ♪: The "other" bombshell report: the Banksters & Climate Change; plus World Water Day, and more. Weekend edition, March 22 2019. The "other" bombshell report: the Banksters & Climate Change; plus World Water Day, and more. Weekend edition, March 22 2019. LATE ADDITION -- FREE BACH CONCERTS ON SUN, MARCH 24: MULTIPLE VENUES; tunefully celebrate the 334th birthday of the incomparable Johann Sebastian Bach! See added feature # 9 (below, following the full original edition). From L.A. to Claremont, Santa Monica to Bakersfield, "we've got your Bach..."
We are a music guide that prides itself on presenting news of interest and value to artists and music lovers alike. So no one is more surprised that we get record numbers of page views -- from all over the world -- when we report news that the U.S. corporate mainstream media ignores or glosses-over. That's exactly what happened (again) with our last edition and its salute to the kids, worldwide, who led Climate Marches a week ago today on every continent (yes, even Antarctica!) Accordingly, since we're on a roll and all those readers are waiting to see if that was an aberration or if we present at least some news features all the time, we present here (drum roll, maestro) an ACTIVIST edition, with news of grossly underreported, important issues -- causes in which YOU CAN TAKE ACTION, with links offered for ways to do that. A crucially important report came out today, and mainstream corporate media isn't telling you about it. No, no, no, we are not talking about the Mueller Report. They haven't even seen THAT yet, but IT'S all they're taking about. The fact they don't know what's in it, and therefore have no actual information to offer you about it, doesn't dissuade them in the least from talking endlessly, on and on and on, yada, yada, yada, about it -- to the exclusion of everything else that can be and needs to be reported. Around here, we're talking about the new report that shows the collusion between the world's biggest banksters and the forces that are driving the acceleration of runaway Climate Change. But corporate mainstream media is doing a Jan Brady. It's all just "Mueller, Mueller, Mueller!" even though nobody has seen his report, since, as the law specifies, it was just sent under-wraps by the Special Prosecutor to the Attorney General. And curiously enough, sent just before close-of-business on a Friday in D.C., when every member of Congress has already boarded a jet for the home district to glad-hand, ingratiate themselves with parochial interests, and attend a fund-raiser or two or three. Perhaps Mr. Mueller, knowing that is the predictably standard D.C. shuffle, hoped to avoid a political circus by submitting his report when he did. Avoiding a media circus is another matter. Bring on the plate spinners and the guy with the chair and the lions. Sheesh. Okay, okay. Our Commander-in-Tweet is quick-witless, with a hair trigger ego that sparks a Trumpertantrum at the drop of a MAGA hat. Especially when confronted by the most paltry snippet of inconvenient fact. But obsessive speculation about a freshly-cooked, still-secret report, isn't ANY kind of justification for ignoring the things that can kill us. Alright then, let's get this Mueller Report thing out of the way so we can go on. It's not like it takes very long. After his 675 day investigation, Robert Mueller said in his letter accompanying his report that he is NOT calling for additional indictments, NOT calling for any indictments related to collusion, NOT calling for indictments of Trump family members or Trump's White House associates for conspiracy or anything else, and he did NOT interview the Trump children or their administration-official spouses, NOR did he interview Trump himself. And now, the report CANNOT be released in part or in full, except by the Attorney General, and the law requires that the A.G. must first prepare and submit a confidential "summary of findings" of the report's contents for the relevant committees of Congress. So, like it or not, what else is there to report there? Uhhh, nuthin', until those other things happen. Whether or not cable's bloviators will acknowledge (read, "admit") that. That clears the decks for us to talk about the OTHER report. Of course, corporate Big Media is using the above as "cover" to hide behind, so they won't be put in the position of reporting on the other one, which would mean "outing" the corporatocracy for its ongoing crimes of greed-power-hegemonistic-control-driven destruction against humanity, society, and the planet itself. 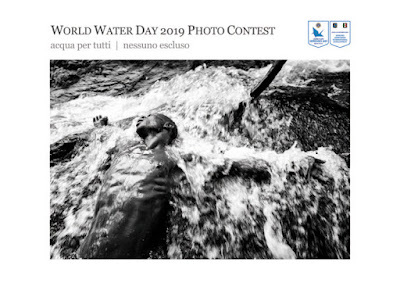 On the subject of important things deliberately not reported, did you even know that today is "World Water Day"-? We didn't think so. We'll get to that, too, since It's another of the most crucial issues in the list of "inconvenient truths" that requires united action by "we, the people." Because those with a vested interest in a profiable status-quo are wantonly killing people through neglect, and waging a successful propaganda war of megamerged media diversion, obfuscation, and distraction so the rest of won't do a head scratch and say, "Hey, wait a minute." If it wasn't yet clear, WE ARE NOT JUST GOING TO TALK ABOUT THINGS HERE. There's a valuable old cowboy adage that if you believe something is wrong, you are obligated to offer a solution if you want to complain about what's wrong. So we do. Offer solutions, that is. THINGS ALL OF US CAN DO -- YOU CAN DO -- about EACH of the things we present in this edition. 9) LATE ADDITION -- FREE BACH CONCERTS ON SUN, MARCH 24: MULTIPLE VENUES; tunefully celebrate the 334th birthday of the incomparable Johann Sebastian Bach! It should be impossible to ignore this week's news on climate cycles gone crazy: from the massive flooding in Nebraska to the cyclone in Mozambique and the warnings that excessive spring blooms guarantee months of wildfires when all that extra plant mass dries and dies in California. Yet, with mainstream corporate media's inability to be inclusive of what causes things to happen, rather than just a tableau of the effects, the disasters, as "news" -- in the face of their obsessed addiction to singularities -- the ludicrous dimensions keep piling up. Like the apparent fact that it's up to us to let you know about the OTHER just-released report -- a report that has massive bearing on whether or not Climate Change will, or even can, be addressed by the nations of the world. Evermore climate scientists concur that we’ve got less than 12 years left to take drastic action to stop the worst impacts of climate change -- and if we fail during that time, it may be game over. So WHY are banks continuing to fund climate catastrophe? 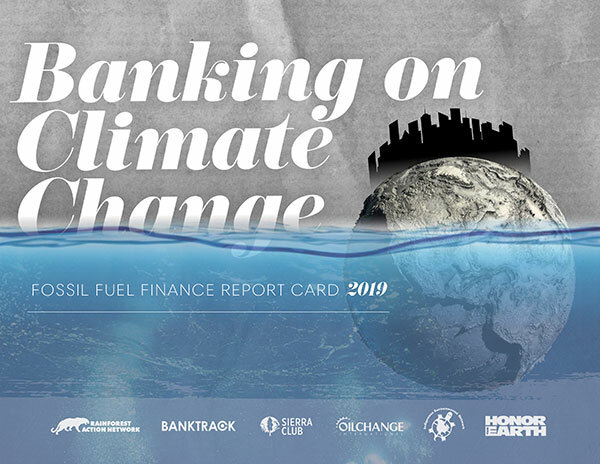 The highly-regarded Rainforest Action Network, one member of an astonishingly credible consortium of researchers and authors who produced the report, said today, "We just released a damning new report that reveals the top banks financing fossil fuels. I’ll give you one guess which bank was literally the WORST." It's JP Morgan Chase. That corporate megalomaniacal bankster empire is cited in the report as THE biggest funder of climate change in the world. 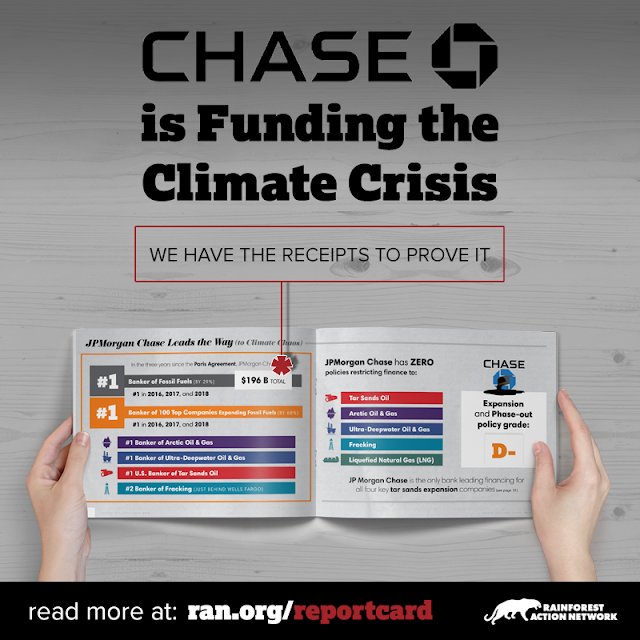 "In just the last 3 years, Chase has spent $196 billion dollars keeping us stuck in the dirty fossil fuel-powered past," says Alison Kirsch, Lead Researcher, Climate and Energy Program at Rainforest Action Network. Sadly, Chase is the worst of a bad lot. The report continues, "In fact, 33 big banks worldwide have spent almost $2 TRILLION in just 3 years on fossil fuels." "Climate change is threatening our lives, and these banks are just throwing more fuel on the fire. That makes Chase the worst arsonist in the bunch, and it’s time for it to end its reign of terror on our planet," says Kirsch. "Over the last year, we’ve been turning up the heat on Chase and its CEO Jamie Dimon to make it clear, we’re DEMANDING it finally defund climate change," she declares. And she's offering a way for all of us to add our voices to that demand. "Can you imagine the difference that nearly $2 trillion in clean energy financing would make to our future? If that’s an investment we make every 3 years for the next 12 years, we have a fighting chance to stop the worst impacts of climate change," Kirsch points out. She adds, "When you’re in a hole, you stop digging. It’s time for these banks to take climate change seriously." WE PROMISED A CHANCE TO ACT ON SOLUTIONS. Thus, we offer your chance to tell Chase’s executive team: STOP funding dirty, climate-destroying, community-harming fossil fuels and invest in our shared future. CLICK THE LINK BELOW to add your signature. Now’s your chance to tell Chase’s executive team: STOP funding dirty, climate-destroying, community-harming fossil fuels and invest in our shared future! 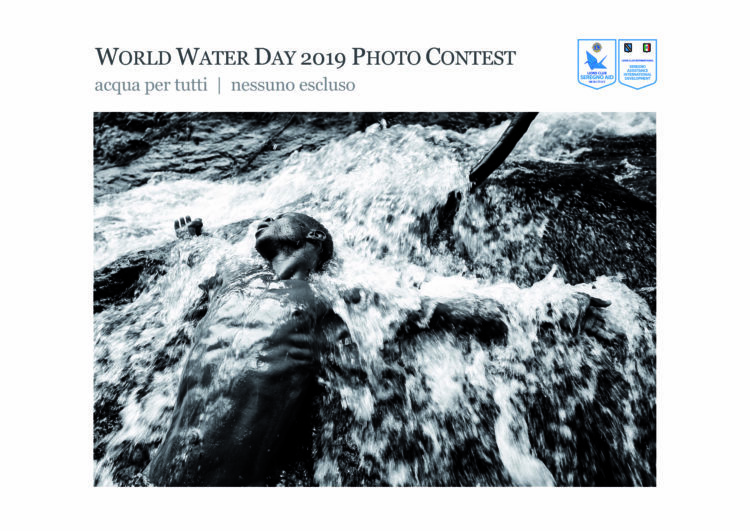 The annual "World Water Day," March 22, is dedicated to ensuring universal access to clean water and sanitation. But as big and heartbreaking a challenge as that is in developing countries, it has shockingly surfaced as a problem that is growing worse, not better, in the United States. In the U.S., access to clean water, and even to sanitation, are threatened due to an expanding list of factors that pit rich interests against public need. These center on: budget austerity that has killed infrastructure renewal projects; fracking; climate change; for-profit privatization of former publicly-owned water systems; overdraft of public water supplies for massive commercial bottling (which also creates plastic pollution); shutoffs and the desperate measures taken by those domestic water service is terminated because they are facing economic crises and cannot pay bills; ever-higher consumption by, and toxic runoff from, factory farms, together with all forms of air and particulate and livestock feed lot excrement pollution that ends-up in rain runoff; plus pesticides, herbicides, and other poisons in the air that become rain; and everything unintentionally carried by flood waters. There is also the magnitude of profitable scams about bottled water. "Water corporations like Nestlé and Veolia have spent decades undermining public confidence in tap water, contributing to a dramatic decline in federal public water funding. 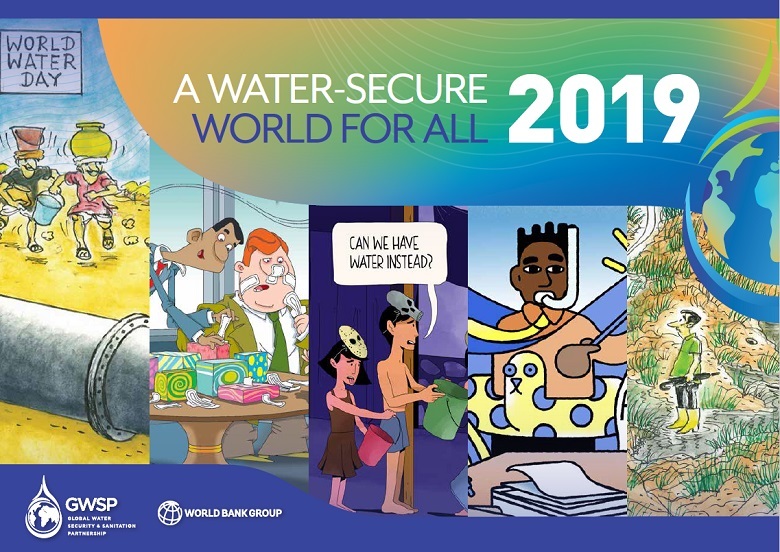 Claiming to solve these problems, private water corporations often target our cities with privatization schemes that are designed first and foremost to generate profit for the corporations -- not improve water systems." -- Alissa Weinman, of the Boston-based "Corporate Accountability." To save our water for future generations -- and fight for communities across the country facing water injustices right now -- the most impactful thing you can do is help push pending legislation for clean water. That's now caught in Congress, circling the legislative Black Hole. You can join the Guide in asking your Congressional Representatives and U.S. Senators to cosponsor the WATER ACT. We are -- all of us -- justified in DEMANDING our elected officials take immediate and effective action because we all deserve safe, clean water in our towns, cities, schools and homes, and we have the right to demand a future where private profit does not immerse us in cancer-causing chemicals and exposure to waterborne disease. Corporations have created a plastic pollution crisis that is threatening the health of our communities and ocean wildlife — including whales, seabirds and sea turtles. Over 90% of the plastics ever produced have not been recycled, yet corporations have plans to dramatically increase their production of plastic packaging. By 2050, it is predicted that there will be 12 billion tonnes of plastic waste in natural environments. Marine life is choking on plastic pollution -- and every minute, an additional garbage truck of plastic trash is dumped into the ocean. More than 3 million people around the world have joined the campaign led by Greenpeace to urge companies to stop polluting our planet with throwaway plastic. And it's working. You can fight the corporate polluters devastating our wildlife and oceans, fighting corporate power to #BreakFreeFromPlastic before it's too late for our oceans. Add your name to BAN single-use plastics. 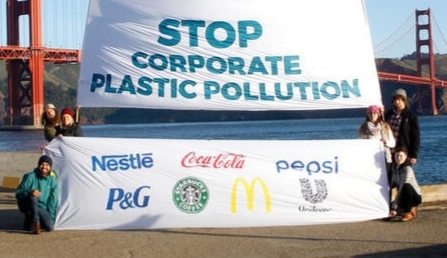 Tell corporations to end ocean plastic pollution. Because of mounting pressure from people like you, corporations are finally starting to admit that they are part of the problem, and they are talking about solutions. But we don't need more talking — we need concrete, urgent action to stop plastic pollution at the source. Tell Nestlé, Unilever, Coca-Cola, PepsiCo., Colgate, Danone, Johnson & Johnson, and Mars to be transparent about exactly how much plastic packaging they are producing and make concrete plans to reduce that amount. It is time for these corporations to invest in alternative ways to deliver their products to us and phase-out single-use plastic. They need to receive the clear message that we need concrete plans for reduction, and we need them now. Add your name to ask the CEOs of these companies to do their part to end the plastic pollution crisis by making concrete plans to reduce the amount of plastic packaging they are producing. Make concrete plans to reduce your plastic footprint now! I urge you to work with Greenpeace and develop concrete plans to phase out single-use plastic packaging and invest in alternative ways to deliver your products that will not endanger our oceans or communities around the world. OR, you can choose to personalize your message. Mid-oceanic plastic patches rival the size of national boundaries. Many plastics break-down slowly, and will outlast those who used them by several human generations. When plastics do break-down, they become part of the oceanic, and therefore of the human, food chain. While the problem is larger than corporate addiction to single-use plastics, that sector is the easiest to address, and the easiest target of consumer boycotts of everything your corporation makes or markets. If you fail to swear-off single-use plastics, we will divorce ourselves from all you do, and put the bad-mouth on you at every opportunity because you insist on proving your recklessly irresponsible devotion to destructive and poisonous greed. Okay, NO ARGUMENT, the whole idea of the 2020 Presidential Campaign season being upon is cruel and unusual punishment. It's eleven-and-half months until the California Primary, which had to be moved-up from June of an election year to March, because too damn many flyover states wanted to be important and had moved their primaries up by a century and a half or so. THAT SAID, it IS happening. In 2016, the Guide enthusiastically endorsed independent U.S. 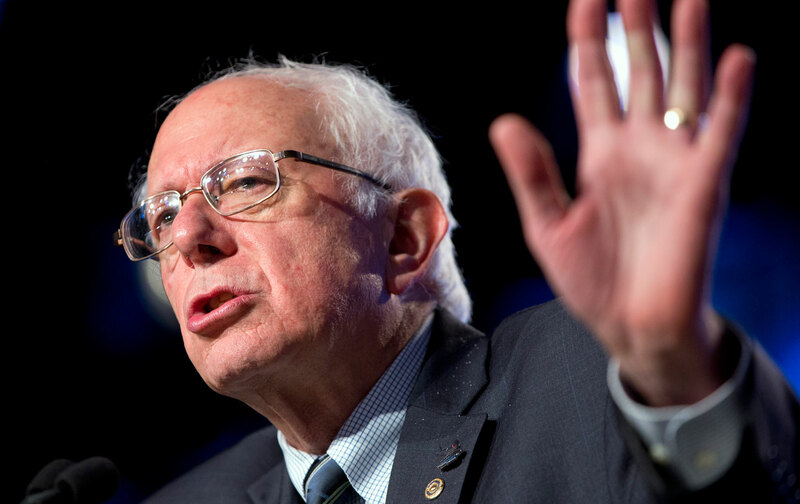 Senator from Vermont BERNIE SANDERS for President. While we have made no 2020 endorsements yet, believing it is just too damn early for such things, we do maintain an eye and ear to the Sanders campaign. in downtown Los Angeles, 200 N Broadway 90012, across the street from City Hall. Rally begins at 2:30 pm, after the metal detection to get in commences at 1 pm. Trust us, watching a speech on a two-inch phone screen is nothing like BEING THERE, seeing and hearing the speaker, being able to get a feel for the sincerity of convictions, the logical consistency of ideas, and assessing the reaction of the crowd. But you'd expect us to say that, since we are THE advocates for live music performances. You can ride the Metro Red/Purple subway to Civic Center/Grand Park Station. 7 pm - "THE HUMAN ELEMENT," examining global CLIMATE CHANGE, is the April screening from "The Conscientious Projector" at the Armory Center for the Arts, 145 N Raymond Av, Pasadena CA. * It's just across the park and across the street from Memorial Park Station on the Gold Line light rail. * "Conscientious Projector marks 'Earth Month' with a riveting and visually stunning account of the impact of climate change around the world in the film 'The Human Element.'" * From the makers of "Chasing Ice" and "The Cove," renowned environmental photographer JAMES BALOG takes us on a global tour of present-day devastation. * The film introduces us to the steadfast efforts of advocates fighting to literally stem the tide, rescue Earth’s life-giving functions, and restore our relationship with the natural world. * POST-FILM DISCUSSION led by WESLEY REUTIMANN of "Active SGV" and "Day One." * FREE, donation gratefully accepted. There are many more that will appear in future editions of The Guide. Meantime, put these on your radar and your calendar. 11am-7 pm - 4th Annual "VEGAN STREET FAIR LOS ANGELES" is actually in the SFV, in North Hollywood. * Named "the largest single day vegan food festival in the world" by the esteemed "HappyCow Vegan Guide." * The annual FREE ENTRANCE vegan food celebration is where local vegan and vegan-friendly restaurants and vendors come together to serve bite-size portions of vegan eats, all in one place. * The best part? It's street fair prices. * Every food vendor has a $4-or-less bite-size portion. * How to play this: instead of buying a $10 plate of vegan nachos and sitting out the rest of the food experiences, use the opt.orgion to get bites from one vendor, move on to the next, and enjoy tastes of all of L.A.'s best vegan eats for the cumulative price of one restaurant meal. * VSF has been named a 2017 Good Food Champion by the Los Angeles Food Policy Council for bringing health conscious food to the community at large. * So, is there live music? We don't know. We figure you're probably interested, anyway. (2) Evening Concert tix (7 pm-10 pm): $25, that concert only; option, +$10, for Limited Reserved seats, Rows 2-4 of seating. (3) "Everything" tix, all day and evening, 10 am-10 pm: $45, with option of +$10 for Limited Reserved seats at Evening Concert, first three rows of seating. * PRICES GO UP AFTER MARCH 24th. A parting comment. As for being an ACTIVIST on this one? Just go outside and look up! "A glowing gold lantern hanging low and large in the sky heralding the first breath of spring. Fossilized amber resin releasing a cascade of crocus and daffodil petals, glory-of-the-snow, graceful iris, radiant life everlasting, and a rainbow burst of tulip." Hmm. Well, not exactly an astronomical description of the night's event in the sky, but certainly a poetic interpretation. These words were received amidst too much blurb-ifying that was advertising -- believe it or not -- a "Snake Oil Scent." Just goes to show that ya never know, unless you jump in, find out, and become an activist. Tunefully celebrate the 334th birthday of the incomparable Johann Sebastian Bach! * "Bach in the Subways" is an international event highlighting the music of Bach in public spaces. It celebrates Johann Sebastian Bach’s 334th birthday all weekend with numerous concerts and events. * it's the 4th year in a row for CANTABILE, their 3rd year at the Glendale Train Station. * CANTABILE is part of the "Los Angeles Chamber Music Players meetup group," and is directed Barbara Don. * Free outdoor concert of Brandenburg Concerti and other delights celebrating J.S. 's birthday. * Performances by string quartet, on viola, and by "who ever else wants to play." * PROGRAM: Bach Double Concerto, Arioso, Air on G, Bach Cello Suite (for viola). LOOKING FOR MORE LIVE MUSIC, CONCERTS, CLUB GIGS, PIE FESTIVALS, FILM SCREENINGS, and other events? Well of COURSE you are, this being The Guide, and all.